Today, New York City joins the likes of Paris, Montreal, and a growing number of cities with the launch of its first bike share program. After much anticipation, Citi Bike finally kicks off with approximately 6,000 bikes and more than 300 stations available in Manhattan and Brooklyn. Those with an annual membership ($95) who signed up by May 17 can start biking around today while daily and weekly pass holders ($9.95 and $25) and other annual members will have to wait until June 2nd. A Citi Bike App will help renters locate the nearest station, indicate how many bikes and docks are available, and offer route tips. I won't say much about the fact that the bike stations are all located below Central Park and the program showed no love to Uptown or other boroughs, but I do hope it makes their way up there eventually and that New Yorkers are mature enough to have nice things. In other words, vandals better not mess it up for the rest of us. Or rather the rest of you because I hopped on a docked bike yesterday and at its lowest setting, the seat was still a tad too high for me. Maybe I'll try again once A. rents one for himself. 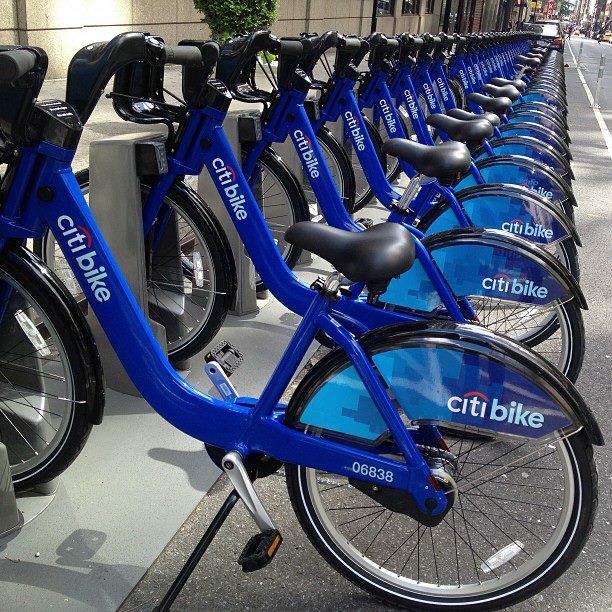 New Yorkers, will you be taking a Citi Bike out for a spin this summer? P.S. Never mind. The NY Post reports that the first Citi Bike was stolen yesterday evening before the program even begun! I was tempted to jump on one when I was there that week. I just fear I'd be hit by a car and dead in the street within a block of my rental station. For now, I'm getting used to getting around the city with the sidewalks and subways.